Tap yourself on the back for being a savvy car shopper! 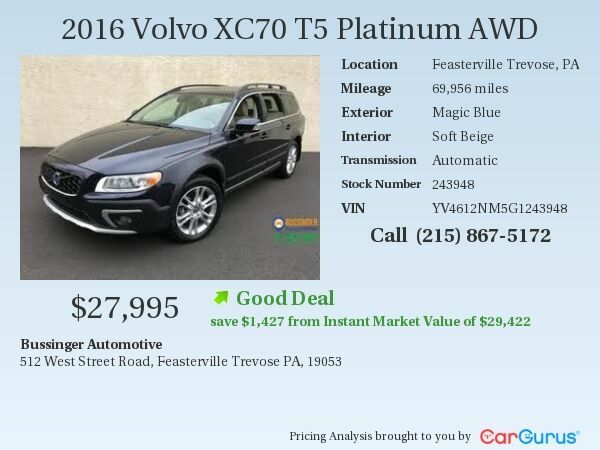 You have just found some of our best deals on new and used vehicles in the Feasterville area. Hurry these deals don't last long, so click the vehicle you are interested in and start saving today. Not quite what you are looking for? Our manager’s specials are changing all of the time so be sure to check back with us here frequently! All Power Equipment, New Pennsylvania State Inspection, CARFAX Certified History Report. This Vehicle Qualifies For An Extended Warranty For 3 Years or 36000 Miles. When Visiting Our Dealership We Hope That You Will Find a "NO PRESSURE - NO HASSLE" Atmosphere Where You Can Shop In Comfort And Buy With Confidence. We Are Family Owned and Operated At The Same Location Since 1956. Each Vehicle That We Offer For Sale Is Freshly Detailed, Newly Pennsylvania State Inspected And CARFAX Certified. Each Vehicle Is Qualified For An Extended Warranty Up To 3 Years or 36000 Miles. Our Commitment To Quality Is Your Guarantee Of Satisfaction. With Over 60 Years of Experience In The Automotive Industry, Our Reputation Will Help Make Your Car Buying Decision Easy and Fun.